Note the ConnectionUri is HTTPS and that the Authentication method is Basic. 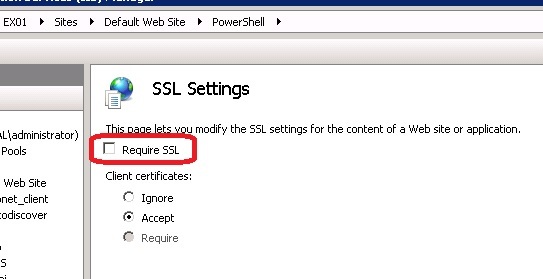 So the customer had attempted to enable this by using PowerShell to force the PowerShell Virtual Directory to accept only SSL connections. Simple uncheck the box and click apply. OK. Local Exchange PowerShell is now working. If the result is True, then the user has permission to connect remotely via PowerShell. ** Note ** Using Basic for Authentication method will cause the connection to fail. Either have no Authentication defined, or choose something like kerberos in our example. You will be prompted for credentials and allowed to connect. If however the connectionURI contains HTTPS and not HTTP, it will fail. Notice that no authentication is configured by default. Let’s enable Basic Authentication as this will allow us to use an SSL connection to remotely connect via Powershell. So there you have it. We now have a successful connection to our remote Exchange 2013 server over HTTPS. I have been struggling with remote powershell for exchange server, and this has solved it. I am trying to establish a PSSession with exchange server 2013 via remote shell. And thanks to you I’m able to do so, but with Basic authentication. New-PSSession : [servername] Connecting to remote server servername failed with the following error message : Logon failure: unknown user name or bad password. Thanks for your detail explanation on this topic, and i had prepare the following script with saved credential and connect to my client Exchange 2013 Server easily.